Celebrating the life of P.G. "Pete" Fleming Jr.
Be the first to share your favorite memory, photo or story of P.G. . This memorial page is dedicated for family, friends and future generations to celebrate the life of their loved one. Obituary for P.G. "Pete" Fleming Jr.
A graveside service for P.G. “Pete”Fleming Jr., age 90, of Jacksonville, is scheduled at 4 o’clock in the afternoon Saturday, October 27, 2018 at Resthaven Memorial Park in Jacksonville. Rev. Steve Goodman will officiate. Services are under the direction of Autry Funeral Home Chapel in Jacksonville. He passed away Wednesday, October 24, 2018 in Jacksonville. Pete was born October 13, 1928 in Center, Texas to the late P.G. Sr. and Mamie Lou (Webb) Fleming. 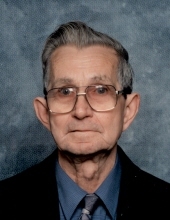 He was a member of Tyler Street Baptist Church in Jacksonville and proudly enjoyed wood working. He was preceded in death by his wife, Josephine Fleming; son-in-law, Charles Lee Busby; a brother, Shorty Fleming and a grandson. Left to cherish his memory are his sons, Rick Fleming and Robert Fleming both of Burleson, Keith Fleming and wife Rose of Jacksonville; daughters, Brenda of Hillsboro, OR and Dot Long and husband Tim of Jacksonville; and a brother and sister-in-law, Jimmy and Anita Fleming of Longview. He is also survived by nine grandchildren including his special granddaughter, Maddie, who has been by his side showing her love for her Pampa; eight great-grandchildren and several nieces and nephews. The family would like to express a special thanks to Felicia Jackson, the staff at Senior Care and Heart to Heart Hospice. "Email Address" would like to share the life celebration of P.G. "Pete" Fleming Jr.. Click on the "link" to go to share a favorite memory or leave a condolence message for the family.